Discover how Sprinklr increased their win-rate and average deal size by listening to prospects for insights. Your customers are online, and they’re talking to one another about your industry and your product. It’s important to listen to these conversations, because the more you can learn about their likes, dislikes, what’s trending, and what isn’t, the more effectively you can respond – with product tweaks, new features, and communication strategies that better address customer concerns. At Sprinklr, this is exactly what we help businesses do. The most complete customer experience management platform, we enable some of the world’s largest brands – like Nike, McDonald’s, Dell, and Microsoft – to better understand their customers, so they can better reach those customers. By allowing companies to gather insights about customers from every social channel, then unifying messaging across each of these various touchpoints, we can help businesses better use social media for marketing, customer care, research, sales, and more. As VP of Sales at Sprinklr, I’m very familiar with the sort of challenges our customers face, because I face them, too. Just like our customers, I need to figure out who our prospects are, where they can be found online, and what’s important to them. Doing this not only helps refine our talking points, it also helps us engage customers in a sophisticated and effective way. Traditional sales tactics like cold calls, email blasts, and direct mail just can’t do it – they’re too broad. To get the level of precision we need, we rely on social selling with LinkedIn Sales Navigator. LinkedIn Sales Navigator has been indispensable in helping us find the exact stakeholders we need to be in touch with. We’re looking for business professionals, and LinkedIn is the platform for business professionals. And since LinkedIn users self-identify by role, it’s easy for us to narrow in on the exact right audience. Sales Navigator also helps us map out the organizational architecture of the accounts we’re targeting. We may not have a direct “in” with the CMO of an organization, for instance, but because LinkedIn reveals who reports to who, we can strategize the best pathways to reach our end prospect. And unlike the lists of leads you might buy for a cold-calling or email campaign, we know that the leads we get from LinkedIn are always accurate and up-to-date. Once we know we’re targeting the right people, Sales Navigator also helps us gather the intel we need to build rapport with leads and engage with them in a meaningful way. By monitoring a prospect’s social feed, we can find out what they’re interested in, what challenges they face, and what initiatives they’re kicking off. We can then use these insights to explain to them, in a specific and compelling way, how our solution can solve their challenges. Sales Navigator also helps build a better path to warm introductions, thanks to TeamLink. 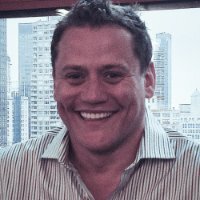 Whenever we’re trying to connect to a prospect, TeamLink shows us if anyone within our organization is connected to them – not just from our team, but marketing, engineering, everyone. We can then leverage this connection to generate a warm introduction – which is much more likely to lead to a real relationship. Thanks to Sales Navigator, we’re converting more than ever, with sales reps achieving a 20% increase in their win-rate. And because we can get more insight into our prospects’ needs, we’re starting to realize more opportunities per lead. 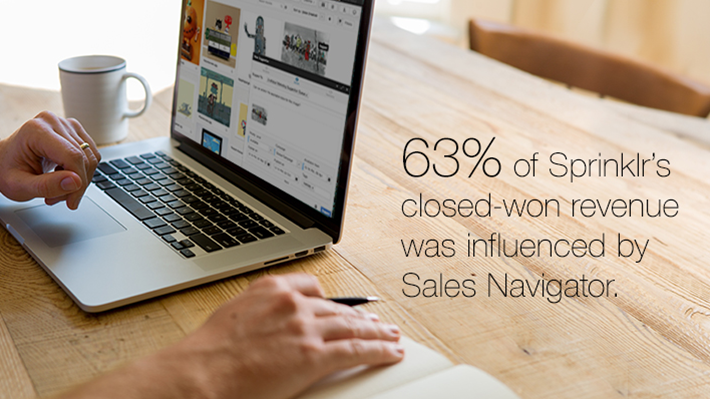 This has led to a 10.4% increase in deal size for sales reps who use Sales Navigator. We knew we’d be big fans of social selling. But with 63% of our closed won revenue now being influenced by Sales Navigator, we didn’t realize just what big fans we would become. It’s amazing what a little listening can do. Want to learn more about how Sprinklr uses LinkedIn Sales Navigator? See the full case study.